To propose a top ten of female inventors is a task that may well lead to controversy. There are, after all, thousands of women inventors to choose from. Nonetheless, here are ten female inventors who left a mark on the world thanks to their ingenuity. Patricia Bath is an American ophthalmologist. In 1988, she patented the Cataract Laserphaco Probe. The probe uses a laser to remove cataracts from the eyes. The procedure is quick and pain-free. People who have lost their sight to cataracts years before and who receive the treatment are able to see once more. More than 120 years ago, Josephine Cochran ran out of patience while washing dishes by hand. She therefore invented a manually-operated dishwasher. Josephine Cochran introduced the machine to the public at the 1893 World’s Fair. The device attracted the attention of restaurants and hotels; but a dishwasher for home use did not appear for another 60 years. 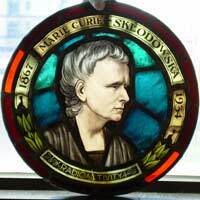 Marie Curie won two Nobel Prizes. The first was in 1901. She and her husband received the award for discovering polonium and radium, two radioactive elements. This first award was for physics. Ten years later, Marie Curie won the Nobel Prize for chemistry. This recognised her achievement in isolating pure radium and assessing its weight. Today’s disposable nappies were the idea of Marion Donovan. She became tired of cloth nappies that leaked and required washing. To avoid these problems, she came up with a nappy that had a plastic cover. Back in 1949, manufacturers were not keen on Marion Donovan’s invention. Consequently, she set up her own business and produced the first disposable nappies. In 1966, a female chemist called Stephanie Kwolek invented a synthetic material called Kevlar. Kevlar has saved many lives; it is the principal material of bulletproof vests. It is lightweight, fives time stronger than steel, and does not rust. During her life, Beulah Henry (1887 – 1973) invented 110 devices and received 49 patents. Among her inventions were a vacuum ice-cream freezer, a sewing machine that did not require a bobbin, and a typewriter that made four copies of a document. Erna Schneider Hoover was a researcher at a laboratory when she hit upon the idea of a computerised phone system. The system could manage all the calls that came through to an organisation. She received the patent for her software in 1971. To many people, Hedy Lamarr is best known as a film actress. But in 1941, she and George Antheil patented spread spectrum technology. Spread spectrum has since developed into a large range of communication devices. In 1941, however, Lamarr and Antheil created spread spectrum to help the allies send secret messages across radio frequencies. Spread spectrum disguised these messages in a code that was impossible to break. Born in 1815, Ada Lovelace pre-empted the arrival of artificial intelligence and computer software. She did this by inventing punch cards that calculated a sequence of rational numbers. In the mathematics field, these numbers bear the name of their inventor, Jakob Bernoulli. What Ada Lovelace achieved with Bernoulli numbers is the equivalent of the work of a modern computer programmer. Mary Walton was a 19th century female inventor with an interest in reducing air and noise pollution. Her patent of 1879, for example, showed how to capture emissions from factory and household chimneys and pass them through water tanks. The pollutants would stay in the tanks. Factory owners and householders could then empty the tanks into the sewage system. Marie Curie, although a brilliant scientist and the only woman double Nobel laureate, did not become an inventor by simply discovering radium and polonium. "Mere" scientific discovery does not conssitute invention or lead to patentable inventions.